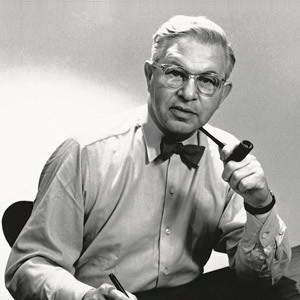 Arne Jacobsen, a world famous Danish modernistic architect, was born and raised in Copenhagen. After graduating from the Royal Danish Academy of Fine Arts in Copenhagen in 1927, he worked at the office of the City Architect of Copenhagen, and launched his own office within two years. Among his famous projects are the National Bank in Copenhagen (1971), SAS Royal Hotel & Terminal, Copenhagen (1960), and St. Catherine's College in Oxford, UK (1963). He ventured into various related fields such as light fixtures, furniture, cutlery, door handles, sanitary fixtures, fabrics, and wallpaper patterns. "The Egg" and "The Swan" are two famous chairs designed by Jacobsen. He is a recipient of several prestigious awards. He taught at the Royal Danish Academy for 11 years, influencing an entire generation of Danish Architects to develop their own architectural language, built upon his rationalistic and minimalist approach toward architecture.